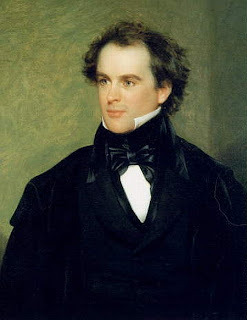 Rather than novels Nathaniel Hawthorne cultivated 'romances' —which allow the writer a quicker suspension of disbelief and more latitude than novels — that border on fantasies and dreams, one can say that narratives such as “The Scarlet Letter” and “The House of Seven Gables” do contain elements of magic realism. In particular, I like the closing scene of The “House of The Seven Gables” in which Uncle Venner "seemed to hear a strain of music and fancied that Alice Pyncheon ... had given one farewell touch of a spirit's joy upon her harpsichord as she floated heavenward from the House of the Seven Gables." This scene is reminiscent of Gabriel Garcia Marquez's fabulous scene in which Remedios the Beauty —a character in One Hundred Years of Solitude— ascends to heaven in the midst of flapping sheets. But it is in Hawthorne's short stories where we find magic realism in full display; or as critic R. P. Blackmur put it, these stories are the "daydreams which edge toward nightmare." I want to focus on his short story "Young Goodman Brown" to highlight the features of magic realism. In this short story, Young Goodman Brown, much like Dante, "had taken a dreary road, darkened by all the gloomiest trees of the forest, which barely stood aside to let the narrow path creep through ... " In this dense forest Brown meets a traveler whom he suspects to be the devil himself, yet the stranger bears a strong family resemblance such as that of father and son. If this scene isn't terrifying in itself, at least is sinister enough to foreshadow what is to come. Delirious, bewildered, and right in the midst of a hellish nightmare brought to reality by the tangible proof of his wife's ribbons, Young Goodman Brown watches the full liturgy of a black mass: "there is my wife, Faith." As he spoke, he pointed his staff at a female figure on the path, in whom Goodman Brown recognized a very pious and exemplary dame, who had taught him his catechism in youth, and was still his moral and spiritual adviser, jointly with the minister and Deacon Gookin." And the entire town he sees there in that wicked witches worship—of the devil! After delighting readers with such hallucinating scenes, Hawthorne's narrator asks: "Had Goodman Brown fallen asleep in the forest and only dreamed a wild dream of a witch meeting?" In an ironic twist, when Young Goodman Brown dies, the entire community —all the participants of the black mass— follow him in a long procession as he is "borne to his grave." Was this a second black mass? While many read this story as a horror story, there is more to it, for all the elements of magic realism —including props such as a staff that resembles a snake, ribbons that materialize, clothing, and an animated forest— mentioned above are present. Like Chaucer, Shakespeare, and other classic writers, Nathaniel deserves to be read. Many good intentioned readers begin to read the first page of “Young Goodman Brown” only to abandon the story a few seconds later. It is the stilted language what deters readers. To make the story more agile and easy to follow, I have removed the ‘thous,” “thees,” and other archaisms—making the prose resemble contemporary American English. Comments on "Young Goodman Brown by Nathaniel Hawthorne [in Contemporary English]"